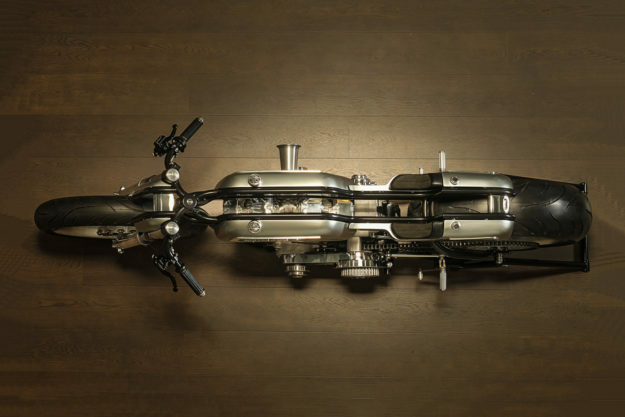 Winning the AMD World Championship of bike building takes skill, genius and commitment. And Fred ‘Krugger’ Bertrand has done it twice. Judging by his latest effort, he’s got a good shot at a third title. 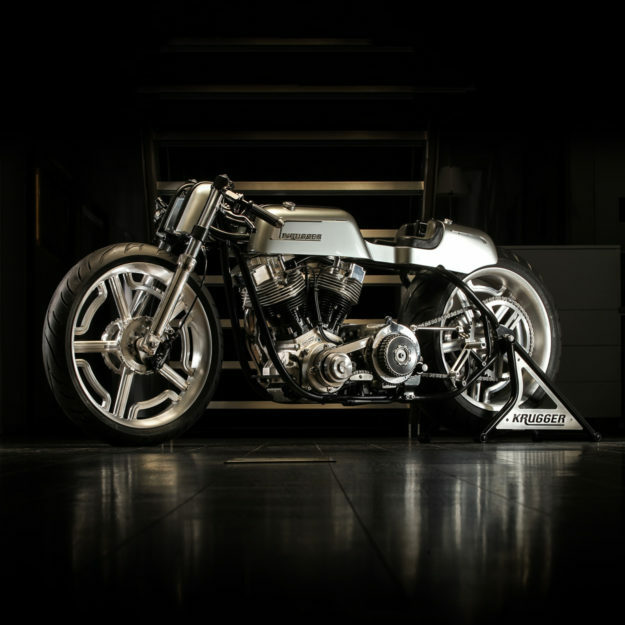 This handcrafted beauty is in Cologne right now, being showcased at the Intermot show and scrutinized by the AMD judges. 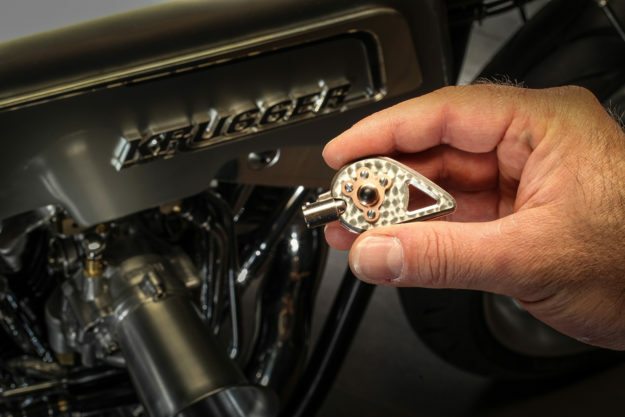 It was commissioned by boutique jewelers Sansen & Gangi, who—like Krugger—are from Belgium. 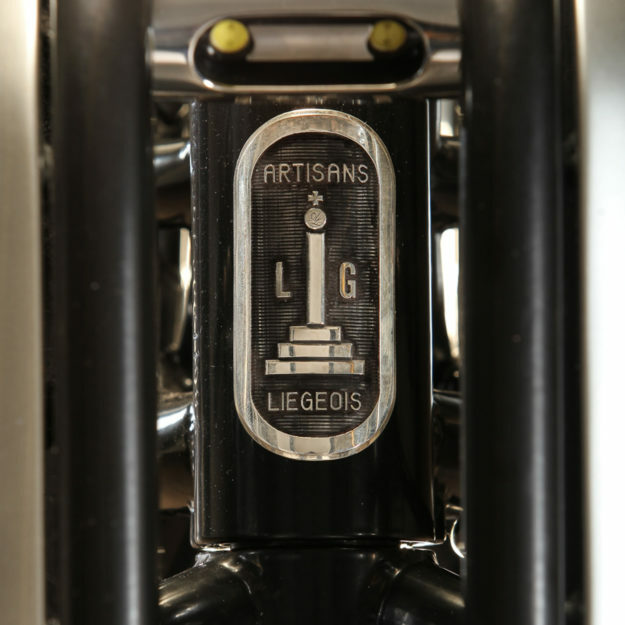 They wanted a bike that could represent their brand, while showing the rest of the world what Belgian artisans are capable of. 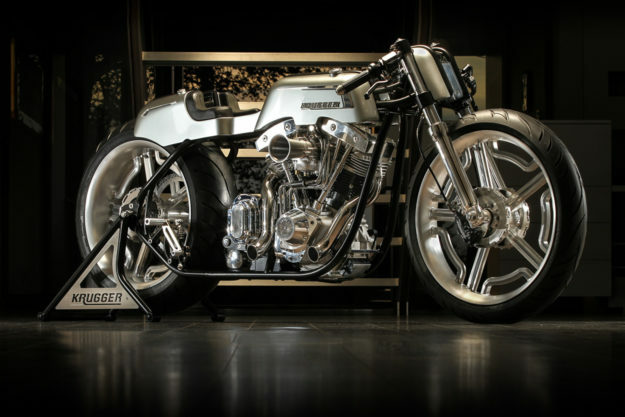 At its heart is the holy grail of Vs: a brand new, 103 cubic inch, Shovel-style unit from specialists S&S Cycles. 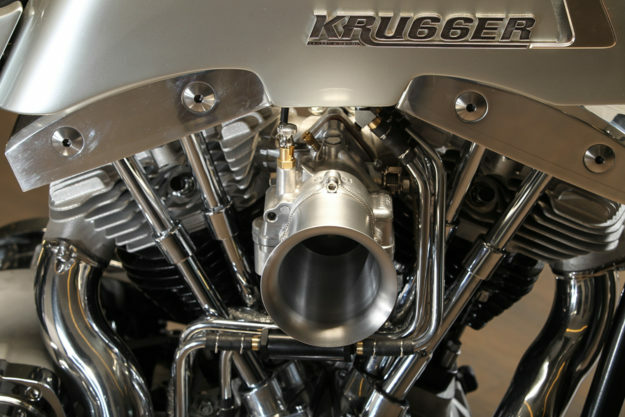 Krugger added S&S carbs and a Super Stock ignition, and one of his own stainless steel primary covers. He also casually flipped the gearbox 90 degrees. 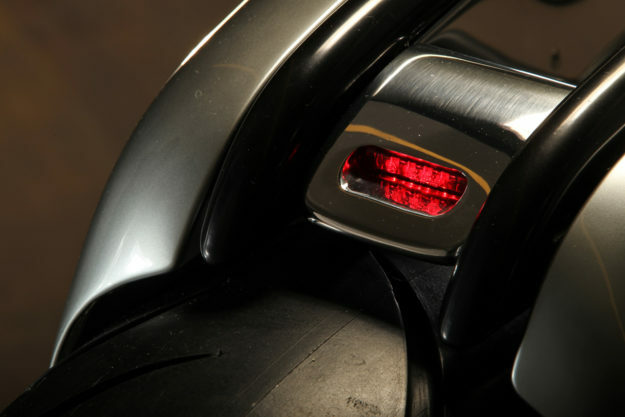 The wiring’s dead simple: minimal lighting, with a Lithium-ion battery and a Spike starter. The front forks are from a Suzuki GSX-R600, held in place by custom triples. Everything’s housed in a totally new rigid frame, hand-made from scratch, and split down the middle. For no other reason than it looks damn cool. Finishing off the rolling chassis are a set of custom-made wheels. 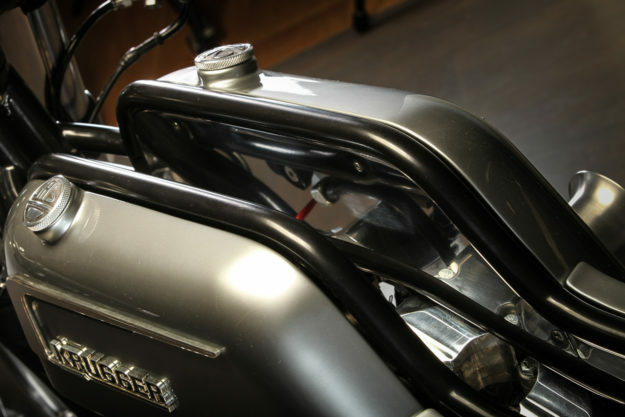 Krugger took a pair of blanks, then lathed, polished and buffed them to perfection. There’s a 21″ up front and a 20″ out back, both shod with Avon rubber. Braking duties are handled by Beringer’s swish inboard braking system. (It’s worth a Google, but, in simple terms, it’s a hub-centric setup). The hand controls are a matching set—with both the master cylinder and a hydraulic clutch taken from Beringer’s catalog. The bodywork is—naturally—all hand-made too. Fluids are split into four reservoirs—three for fuel, and one for oil. The teeny, tiny seat pads were upholstered by Wildhog in Italy. The project wouldn’t be complete without input from Sansen & Gangi themselves. So they got to work creating some truly special ornamental pieces to cap off the design. “At the first sight, the challenge was to enhance the general design without fading away the inner dynamic feeling,” they tell us. Each letter of the Krugger logo was blackened using a potassium and sulfur mix. 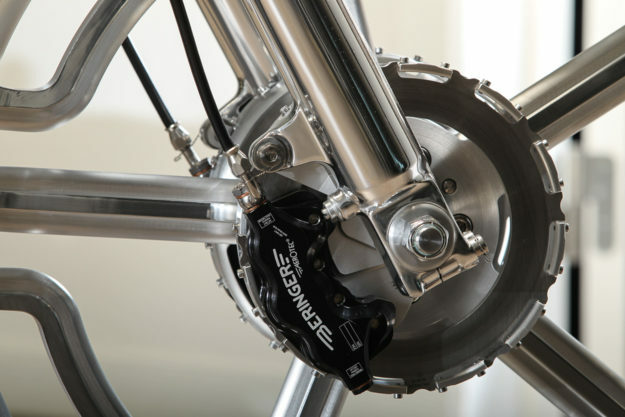 They also created various silver covers and plaques, scattered throughout the bike. It’s a little over the top, but then that’s the point, isn’t it? Krugger’s dubbed his creation ‘Ladd,’ after the historic dragstrip at the Ladd Air Force Base in Alaska. 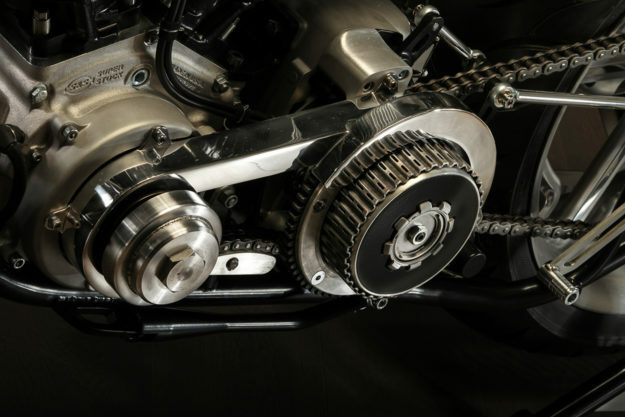 It would probably be a hoot to unleash all that power from the S&S motor—but we’d need hours of close-up ogling first, before twisting the throttle. 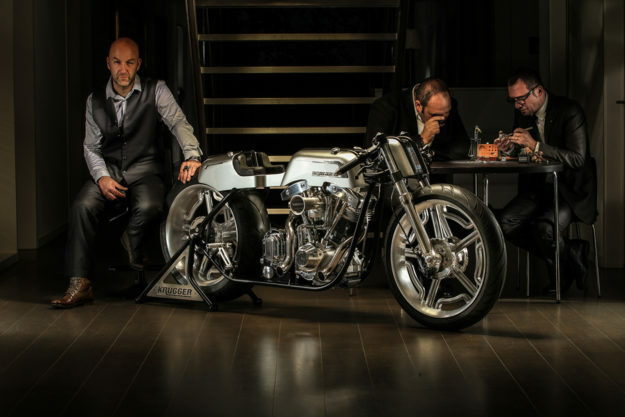 Krugger would like to thank: Wildhog, Beringer, Thierry Dricot photography, Mecagen, and his assistant Adrien Jowa.